In the garden of a King’s palace there grew a wonderful apple-tree, which every year bore three golden apples. But up to the time my story begins, neither the King nor any of his family had ever tasted the fruit of this tree. “Why do we never eat of these golden apples?” asked the three Princes of their father one day, just as the fruit was ripening. So that same evening the eldest Prince hid himself in the garden near the apple-tree and there awaited the arrival of the Monster. As soon as the palace clock had struck midnight he heard coming nearer and nearer sounds as of heavy feet tramping across the garden beds, with snortings and growlings; and the valiant Prince, frightened out of his wits, ran away as fast as his legs could carry him. But when the King went to look at the tree, lo! there were only two apples left, and all the grass and herbs all around the tree were crushed and trampled! That night the second Prince went to keep watch; but he proved no braver than his brother; and in the morning the King found only one apple left. Well, on the third evening, it was the turn of the youngest. He, however, did not hide himself, but laid him down on the grass at the foot of the apple-tree, and waited. And the roaring of the Monster did not frighten this brave youth in the least; for, as soon as he heard the noise of his tramping, up he jumped, and before the creature could come near the tree, aimed a javelin at him, and wounded him in the eye. The two Princes followed him with mocking laughter; but when they came to the apple-tree they saw that their brother had really had an encounter with the terrible Monster, for the ground all about was reddened with blood, a long track of which showed which way the wounded creature had gone. “Let us follow this trail,’ said the youngest, “and we shall find out his lair. He led them out of the garden into the forest, and presently they came to a deep well, where the trail stopped. “He must have gone down this well to die,” said the eldest. The others did as he bade them; but the eldest had hardly got half way down the well when he cried “Hot, Hot” and was drawn up again. The second Prince then offered to go down; but when he was near the bottom he, too, lost courage and cried to his brothers to pull him up. “Let me down now,’ said the youngest, and when I call “Cold, Cold!” you may pull me up. “He went down, and down, and still lower down, till at last he came quite to the bottom, and there, to his great surprise, he found himself in a strange and beautiful country, with tall, shady trees, flowery meadows, and running waters. Walking about here, he presently came to a splendid palace. The door stood wide open, but there was no one to be seen, neither man nor djin. He entered a wide marble hall, and after passing through several apartments, each more magnificent than the last, he came to one in which sat three maidens as beautiful as the Angels in Paradise. The Prince hastened to the chamber the Princesses pointed out, found the Monster asleep with his remaining eye open, hurled his javelin, and wounded him in this eye also. Well, the youngest Princess had already fallen in love with her handsome and heroic rescuer; and her sisters, deeming that his elder brothers could not be less worthy Princes than he, gladly consented. Having placed a ring on the hand of each, he led them out of the palace to the well-opening, at the top of which the elder Princes still waited, wondering why their brother tarried so long below. Our hero then tied the eldest Princess to the girdle which was still hanging down, called out “Cold, Cold!” and the maiden was pulled up. The others, however, took no notice, but hurried the three Princesses away to the palace, telling them that they would send men to draw up their brother, as their arms were weary and they feared to let him fall. By and by the poor youth realised that his brothers had cruelly deserted him, and that he must achieve his own deliverance. 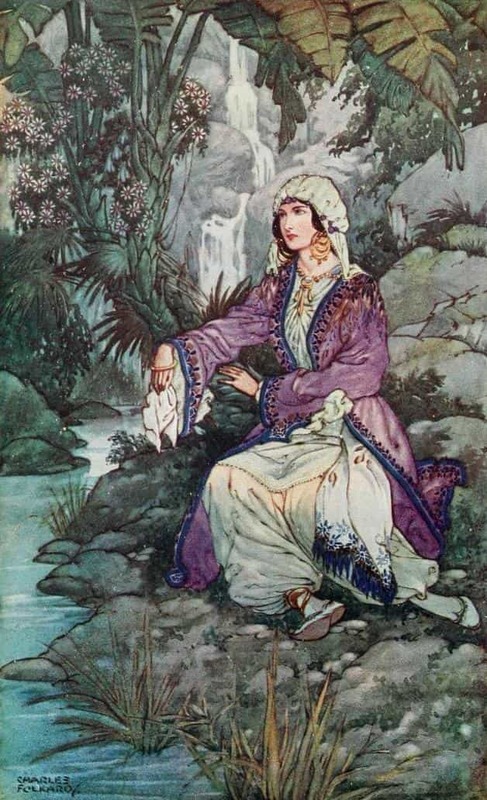 “On the bank by sat a young maiden weeping.” Illustration by Charles Folkard, published in Ottoman Wonder Tales (1915), by Lucy Mary Jane Garnett, A and C Black, Limited. The King’s son did as he was directed, and soon found the two rams grazing together. But, alas! it was the black ram that he got hold of, and he felt that he was being carried swiftly down into a still lower world. When he opened his eyes again he found himself on the banks of a stream which, issuing from a cleft in the rock, flowed gently through the valley, and on the bank near by sat a young maiden weeping. As he spoke, a frightful hissing noise was heard close at hand, and the Monster with seven heads now appeared from behind a rock. On catching sight of the young hero, he stopped a moment as if startled, and the Prince, seeing his opportunity, hurled a javelin straight at his heart. A torrent of flame issued from his seven terrible mouths, together with a roar that shook the hills. But that was all; and the Monster, stretching his hideous length on the grass, lay there dead. “Farewell, my deliverer!” cried the maiden, as she hurried away, whilst the youth cut out the Dragon’s seven tongues to keep as a trophy. Then, fatigued by all his late exertions, he lay down at the foot of a tall tree and slept. Soon, however, he was awakened by the hiss of a serpent which was on the point of seizing a nestful of Eaglets perched on a branch above. With one javelin-stroke the reptile was killed as the Dragon had been, and the Prince went to sleep again. Well, the Eagle flew up, and up, and still higher up. Presently he cried “Crak, crak!” and the Prince gave him meat; then, “Crouk, crouk” and he gave him to drink. But the provisions were finished before they arrived at the opening which led to the upper earth. “Crak, crak! Crak, crak!” cried the Eagle once more. The youth made no reply, but, drawing his poniard, he cut a piece of flesh from his thigh and placed it in the Eagle’s beak. “This is human flesh,”said the bird to himself, and he kept the piece under his tongue. At last, towards evening, he set down the King’s son safely on the upper earth, in the garden of the palace. “Here you are at last! Walk now!” said the King of the Birds. But the Prince could not move, so painful was the wound in his leg. “Walk! I say,’ repeated the Eagle. Then the youth confessed that, having run out of meat, he had given him a piece from his own thigh. “I knew it, and so I kept the piece under my tongue. Here it is!” and with this he put back the flesh in its proper place, and the wound immediately healed. The Eagle then took leave of the Prince and flew away back to his nest. “What am I to do now?” thought the youth. After reflecting a little, he waited until darkness had fallen, and then, without being seen by anyone, made his way to his own chamber. There he disguised himself as a working lad and set out for the shop of the King’s tailor. So the young Prince went into the workroom, sat himself down cross-legged on the vacant board, and stitched away diligently. 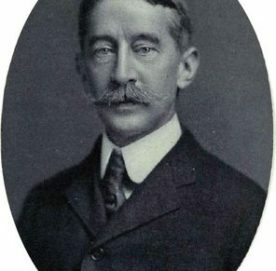 In the meantime his brothers did nothing but quarrel for the hand of the youngest of the three Princesses; and at length, to put an end to the dispute, the King decided that his eldest son should marry her. The King was rather taken aback; but all the same he promised that the Princess should have her wish. So the Court tailor was sent for, and received the order for the three dresses. The poor man returned bewildered to his shop, wondering how in the world he would be able to accomplish such a magnificent piece of work. Day after day he pondered, and all night long he dreamed of the dresses, but they were not a bit the nearer completion. At last he came to the conclusion that the task was an impossible one for him. His new journeyman, seeing him thus pensive, one day ventured to ask what ailed him. So they twain went to the King and told him all that had happened. And the King was so angered when he heard of the treachery of his two elder sons, that he would have killed them with his own hand had not the young couple interceded for them and begged that they might only be sent into exile. Well, now the troubles of the brave Prince were at an end, and on the very next day preparations were begun for his wedding, which was before long celebrated throughout the land with great feastings and rejoicings. This is the end of the story of the Three Wonderful Dresses.